I have spring on my mind as yesterday was spent pottering, tidying and planting the garden very heavenly indeed.Â All the while I was reworking in my mind how I want my outside space to look as I have recently been inspired by the work of design genius Kevin Haley.Haley designs for Hollywoodâs elite with Brad and Cameron amongst the client list and you can see why. Haley creates the dreamiest hideaways not just inside but outdoors as well. He plants gardens so densely you almost donât need window treatments â bliss. I am determined to somehow do the very same thing as my terrace is way to boring even with its brick fireplace and moose. 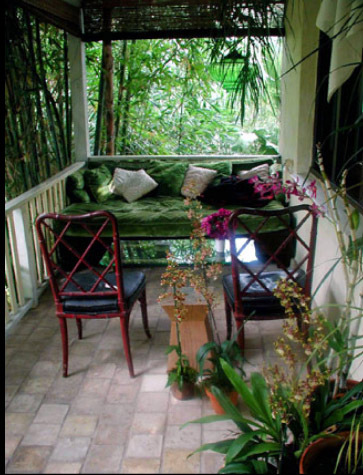 I want a jungle, yes a jungle that is abundantly green all year round and full to the brim of heady scents. 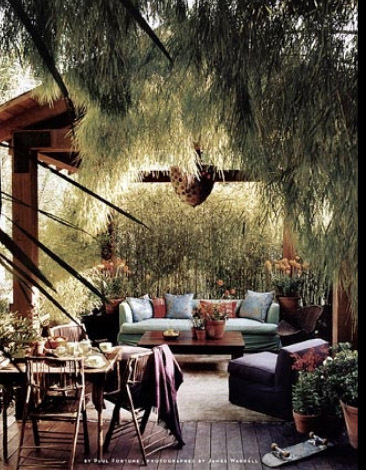 Rooms whether outdoor or indoor need to feel like a cocoon, an uber relaxed cocoon and my garden I think feels very un cocoon like. Thatâs all about to change hopefully with comfy sofas, little lights and tables on my wish list. What I have been doing all my life to only have just realised this is beyond me! I love this adore space it feels totally lived in and loved.